I always love sharing my photos of Contrary polishes. I still think it's one of the best indie brands out there with such a consistently beautiful line of shimmery and ultra fine glitter polishes. I have swatches of the semi recent No Place Like Home Collection for you today, and there are some absolute must haves in this bunch. 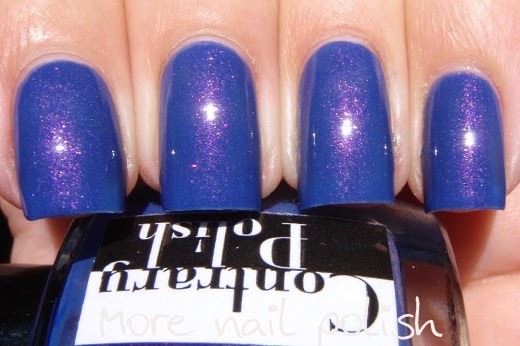 18th and Vine - Deep periwinkle with pink shimmer. 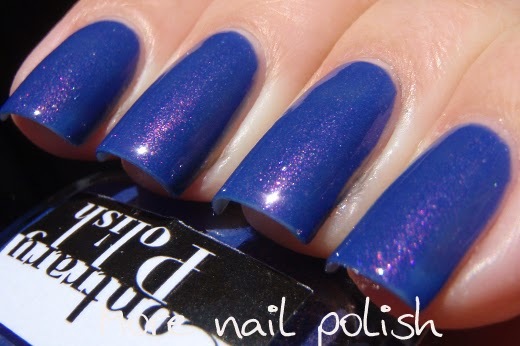 Absolutely stunning and perfect blue shade that leans purple because of the pink shimmer. Perfect formula. This is two coats with Seche Vite top coat. 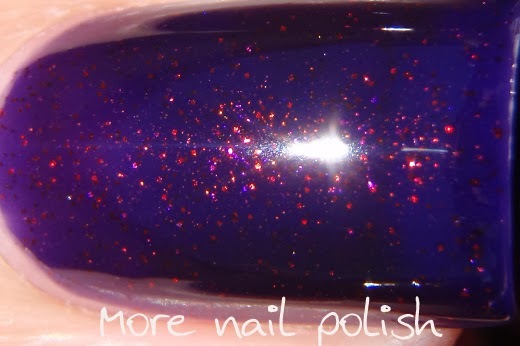 River Market - dark purple jelly with raspberry shimmer/microglitter. Oh wow. 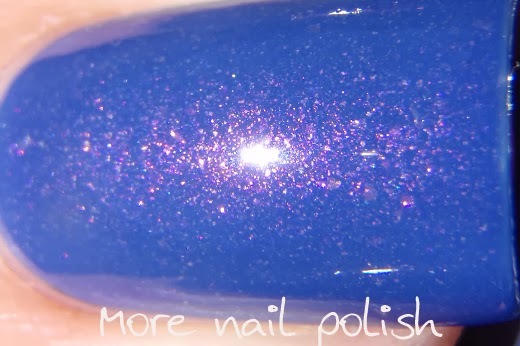 The base of this polish is just so divine! It's a really dark blue leaning purple jelly and it reminds me of the concentrated ink colour from blue ball point pen. Formula was perfect. 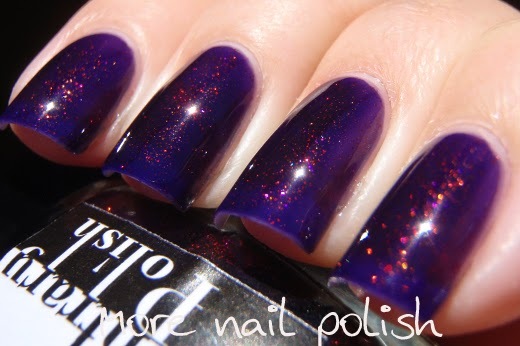 In the sun you can see through to a glowy nail line, but in the shade or indoors, the polish is very dark and vampy. This is three thin coats with Seche Vite. The Boulevard - a dusty greyed blue/green jelly with orange shimmer/microglitter. In classic Contrary style, I love how the shimmer is such a contrasting colour to the base. At the risk of repeating myself again, I'll say the formula was perfect. This is two coats with Seche Vite top coat. The Plaza - concrete grey with ruby red, bright blue, and yellow shimmer/microglitter. 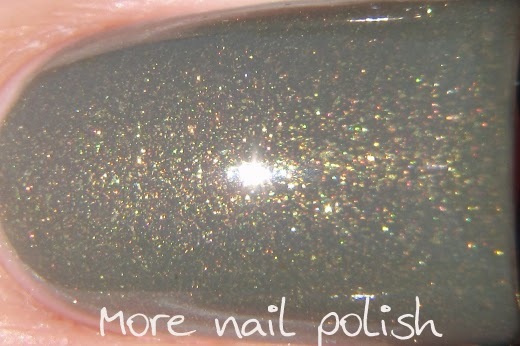 The shimmer in this one isn't strong like the other polishes, it's more speckled with the micro fine glitters. Perfect formula and shown here at two coats with Seche Vite. West Bottoms - fluorescent yellowish green with gold to green shimmer; glow in the dark and UV-reactive. 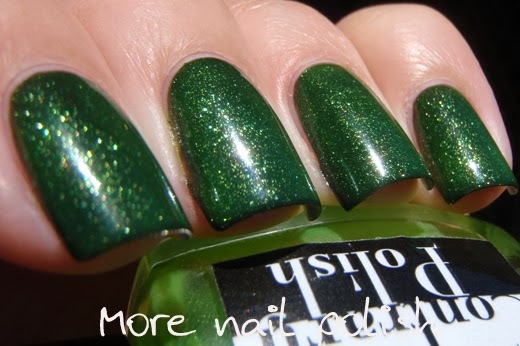 I've got swatches of this three ways, first up is on it's own. This is three coats, and as you can see it's still really sheer and jelly like. 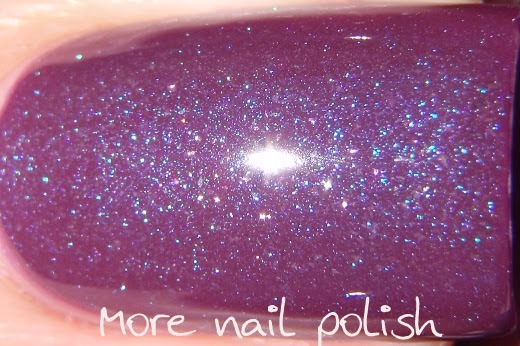 But this polish is really made for layering, whether it be light or dark colours. Layered over white it's becomes electric and glowing. If you haven't already see Chalkboard Nails awesome double glow-in-the-dark and normal lighting swatch of this, then you must check it out. I sucked at capturing it both in UV and in the dark, but trust me when I tell you it glows beautifully, especially layered over white. 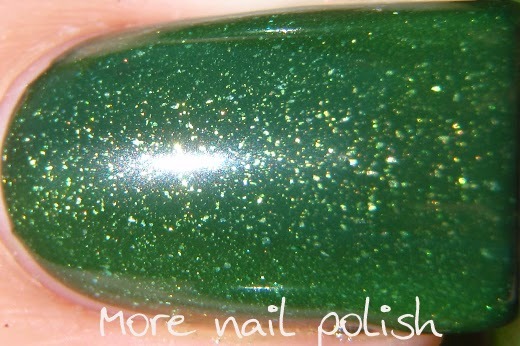 Here I layered one coat over dark green, you can still see the glowing properties and the shimmer is just amazing. 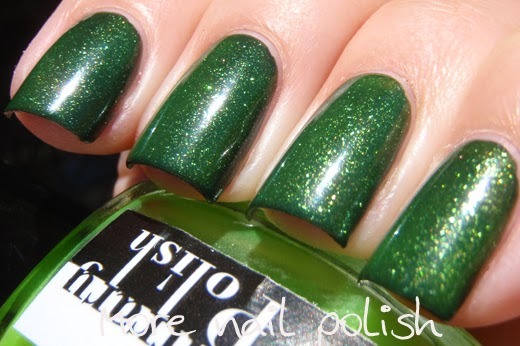 Westport - dusty olive green with varied gold shimmer. In the sun the base colour lightens up and it appears a more taupe shade. This is two coats with Seche Vite. Lastly I have the beautiful Gift Wrap, which was released in July for the one year anniversary of Contrary polish. 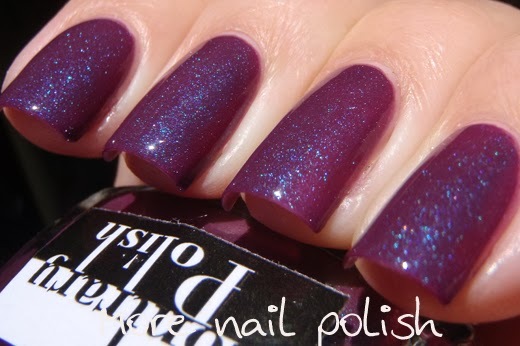 Gift Wrap has a deep grape base and an icy blue shimmer. It dries to a satin finish and it looks completely different without top coat to when top coat is applied. With top coat applied, it's a totally different looking polish. These swatches are two coat. There are so many great polishes in this collection, there is no way I could just pick one favourite. 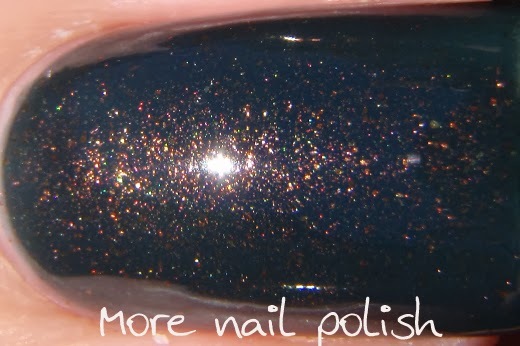 The formula on all of them is really fantastic and I just love the contrasting shimmer to base mixes. This collection has been around for a few months now (it was the Fall collection), and another collection (the Winter collection) has just been released last week, so you might want to grab your favourites before they are gone. I love the first three! They're gorgeous! I love the Boulevard. It stands out to me! 5 of these just went on my wish list. Fantastic swatches! What a stunning bunch of polishes! 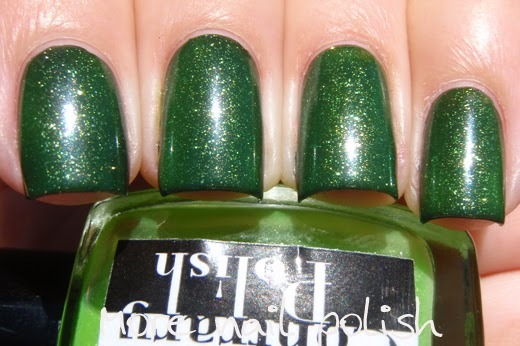 Great swatches and pix as always! I couldn't resist 18th and Vine, so it's in the collection, but need to wear it! !